In NYC Medics Restricted By FDNY Pending Investigation Into NYPD Custody Death, The Social Medic writes about the death of Eric Garner during an arrest. Death may have many different causes. Is there any one thing that would have resulted in Eric Garner still being alive – if it had not been done (or if it had been done)? We probably never will know. Did Eric Garner deserve to die? No. Was there a valid reason for an arrest? There is nothing in this video to answer that question. Should the police have tried to take Eric Garner down the way they did? Is that a real choke hold, or a movie of the week choke hold? How much choking was going on? How much resisting was going on? The videos only show some of what was going on, but it seems like this was not well thought out. Eric Garner is a big man and should be approached with a well coordinated plan for the safety of everyone – for the safety of Eric Garner, for the safety of the police, and for the safety of the bystanders. Was ESU (Emergency Services Unit) there? Was a Taser available and is Taser use permitted in that jurisdiction? A Taser might have saved Eric Garner’s life, but Eric Garner still might have died, even if the police had not arrested him. Sudden death happens hundreds of thousands of times a year in America. When the police initially take him down, they brush up against/bounce off of a window. If it is glass, what would have happened if it broke? If it is glass, what if they had continued through the glass? If it is not glass, how do they know? The difference between broken glass and a knife (or a sword) is not in the amount of danger they present, since all can kill you very quickly. This difference is in the perception of that danger. 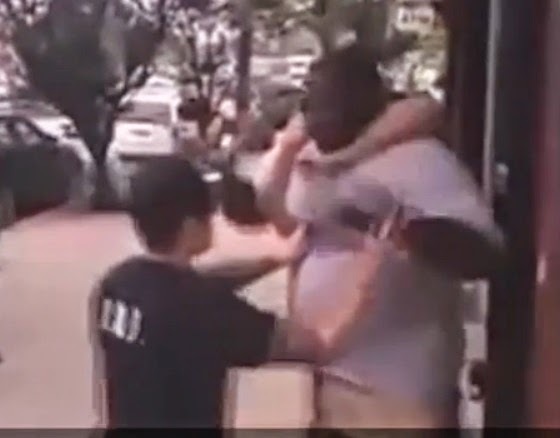 In this video, Eric Garner repeatedly states that he cannot breathe, but this is probably not the first time that police have heard similar statements while wrestling someone into custody. EMS was not there, so no treatment was immediately available, if any treatment had been indicated. We cannot tell. His death later is not proof that he was having trouble breathing, but it does suggest that he was not breathing adequately. The commentary from the person filming the video is useless. It is just as prejudiced and uninformed as that of any other politically motivated commentary. All he did was break up a fight? Unlikely, but how would the person filming this know? Prejudiced cops on Staten Island, this is what they do? Does that applied to the non-white cops, too? Or is that just a prejudiced comment? Prejudice does exist. Nobody is immune from it, but what is the critic basing his comments on? He appears to be basing his comments on his prejudice. Eric Garner was beat up? He was violently subdued/wrestled to the ground, but I did not see anyone strike him. Eric Garner was not beat up. The critic seems to be singing along with the music in the background, which does not really give the impression of someone who thinks he is witnessing someone being killed. He makes a lot of accusations, but his actions do not match his words. If you are singing along with Muzak, you appear to be indicating that there is nothing important distracting you from your singing. Maybe it is someone next to the critic, but that still suggests that there was not a lot of concern among those as close to events as the critic. Did the police choke Eric Garner into submission or did one officer overestimate the effect he would have on a much larger guy by grabbing him around the neck? Someone has written, None of the officers knew what to do in this situation on the bottom of the video. What would the film critic like the police to do? Should they put Eric Garner in the back of a police car? What does the film critic suggest that they do? They have called for an ambulance and they have Eric Garner in the rescue position. Did the police use an inappropriate method of arresting Eric Garner? The prohibition on the use of a choke hold for restraint may have more to do with the way things look to bystanders, than the effect it has on the person being restrained. Choke holds are not prohibited in most combat sport because apparently choke holds can be used safely. Did the choke hold cause death? Image credit – Wikipedia article on choke holds. At about 4:30 of the video, EMS enters. I have not commented on what The Social Medic wrote about this incident, yet. I will comment on what can be seen of what EMS did (did not do) and whether excited delirium is a part of this in Part II.